There’s a lot of good things to be said about Bucky Bingo. From the great bingo environment to the creativity at play – we recognise it as one of the great online bingo sites. Bucky, bred in 2007 from Buckingham Bingo, one of the big name bingo balls famous for its thrilling live games of the 70s, has managed to retain the magic of the golden age providing top shelf bingo entertainment. Players love the site and for good reason too. The company tagline ‘we treat loyalty like royalty’ is evident with tons of promotions, rewards and bonuses on weekly/monthly basis for those that stick with the site. Games available at Bucky Bingo are diverse and well made with the brand new HTML site meaning both desktop and mobile players can play in harmony. There’s your usual 90 and 75 ball bingo, played with your usual cards of 25 numbers. There’s also a generous helping of free bingo every day in the BB room between 10:00 and 11:00 with a second chance to play at 22:00 to 23:00 – best get that alarm set. There’s a wide selection of slots to choose from whether it’s Rainbow Riches or Heart of the Jungle, Rich Treats or The Winnings of Oz – there’s a slot for everyone. Unlike most sites, Bucky Bingo has games playing 24/7 so you can get in your daily dose of bingo when you’re struggling to sleep. New player offers at Bucky Bingo are hard to beat. We’ve got 3 deposit bonuses when you sign up today at Bucky Bingo. What more could you ask for? 1. First deposit: Spend £10 get a £10 bingo bonus and 50 Rainbow Riches spins. Make your first deposit of a minimum of £10 and receive a £10 bingo bonus and receive your first 50 Rainbow Riches spins. How’s that for a welcome? 2. Second deposit: Spend £10 get a £10 bingo side games bonus. What’s better than 1 deposit bonus? That’s right – 2 deposit bonuses! Make your second deposit of a minimum of £10 and receive a £10 bingo side games bonus. That’s your slots covered for the week. 3. 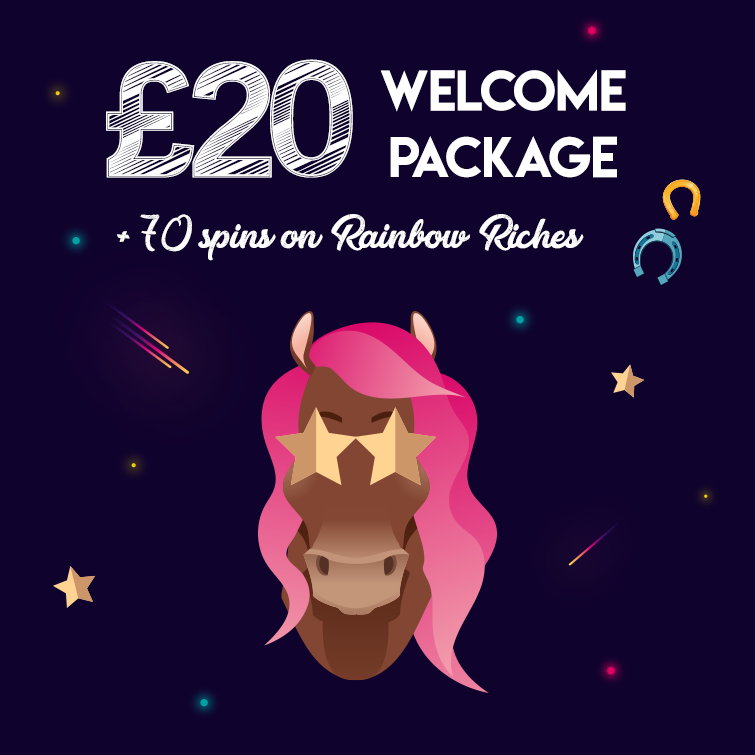 Third Deposit: Spend £10 get 20 spins on Rainbow Riches. Not 1. Not 2. But 3. That’s 3 deposit bonuses available at Bucky Bingo. Make your second deposit of a minimum of £10 and receive your final 20 spins on Rainbow Riches. It’s the little things that make a great bingo site. To claim, simply follow one the pictures featured or click here to be whisked away to Bucky’s stable. When it comes to Rainbow Riches, players will be credited with a £10 games bonus upon qualifying for the welcome offer. The £10 games bonus is equal to 50 spins for Rainbow Riches at a value of 20p/spin.